I’ve been to Washington DC (well, Arlington, VA) twice in the last month with work – both times at short notice. This has meant leaving Anne quite literally holding the baby (ThingOne). And I’ve missed the monkey. And I’ve missed ThingOne too (you see – I was calling Anne a monkey). Each time I’ve left for the US ThingOne has been ill, and wanted to sleep on one of us all day. When she's like this she seems very much like a small baby again. It’s been sad to leave, but while I’ve been away Anne has been sending me photos of a seemingly different girl – now confidently walking around and interested in everything. It was great to come home last week to a well baby and as the weather was nice on Sunday we took her, along with some friends and their baby of a similar age, to Wimpole Hall Farm not far from Cambridge. ThingOne’s been interested in animals recently, but mainly sees dogs, cats and garden birds, so it was good to show her some pigs, cows, goats and chickens. 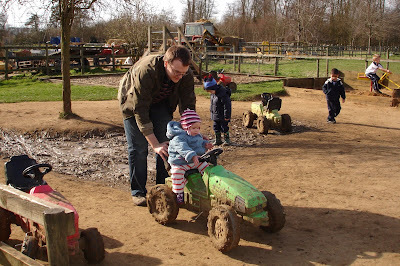 Mainly though she enjoyed the playground and especially being pushed around on a toy tractor. Somehow we’ve created a fearless girl. 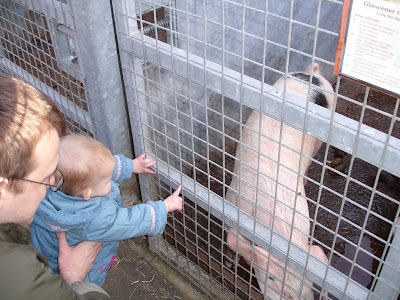 She was trying to touch the snouts of HUGE pigs through the bars and didn’t seem fearful of any of the animals. Mainly, ThingOne wanted to walk as far as she could away from her mum and dad. I don’t know how far she’d have gone if we’d let her just walk and walk, but we let her go pretty so far and she didn’t show any signs of stopping. ThingOne had a pretty poor night’s sleep after her trip to the farm. I think we may have over-stimulated her, poor lamb.